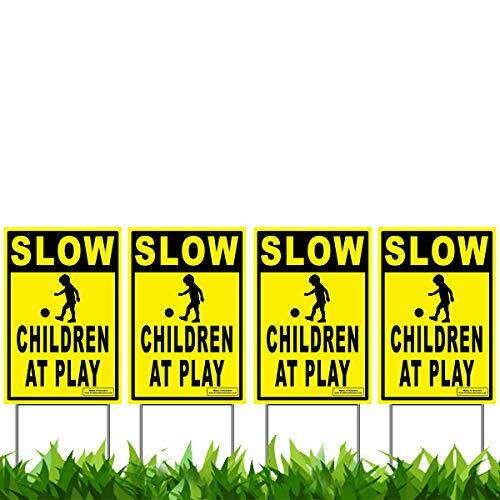 This "Children At Play" Slow Down yard signs 4 pack kit is made by Vibe Ink. Designed to help drivers slow down near areas that have children, schools, day cares, etc. Trusted by over 30,000 people. Great for Parents, Home Owners Associations, Realtors, Real Estate, Daycare, Childcare, Schools, Businesses, Parties, Neighborhood Associations & More! The highly visible (12"x 18") Yellow & Black Yard Signs will ensure drivers will see the signs even at night time! We also provide a very wide yard stake (10" length x 15" height) which helps to keep the sign standing through more severe weather conditions. Size: 12 inches in length x 18 inches in height. Made in the USA! Printed with UV ink - Front and Back for Longer-Lasting Vibrant Colors! Use: Indoor OR Outdoor use - Waterproof and Wind Resistant! Display in your front yard, lawn, garden or any area with grass! View More In Yard Signs. If you have any questions about this product by Vibe Ink, contact us by completing and submitting the form below. If you are looking for a specif part number, please include it with your message. 1-Pc Fiduciary Unique No Trespassing We Don't Dial 911 Signs Security Warning House Lawn Pole Protect Poster Sign Under Cameras Protected Guardian Business Alert Window Post Tools Size 7"x11"
6 Pcs Inspiring Unique Warning Security Cameras in Use Video Surveillance Sticker Yard Sign Adhesive Premises Monitored Business Under Protect Post Window Hour Tools Hr Decals Outdoor Lawn Size 4"x2"